Shelves in the adhesives aisle of the hardware store are packed with a dizzying array of glues. And for good reason: various types of glue perform differently from each other and are better for some applications than for others. The good news is, as a homeowner, you needn’t store numerous types of glue on your own shelves. With a few select glues on hand, you can perform many routine repair and maintenance jobs without frequent dashes to the hardware store. Instant glue (formally, cyanoacrylate) is a great all-around glue to keep on hand. Grab it to glue a soap dish back on the shower wall, piece a broken vase back together or tighten a wobbly chair leg. This handy glue bonds just about anything – wood, metal, plastic, fiberglass, chrome, you name it – in seconds and dries to a near-clear line. 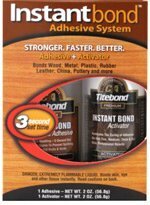 You’ll find several brands of instant glue at the hardware store, but one stands out on a couple of counts: Titebond Instant Bond. It works on oily woods that can be difficult to bond, such as teak, and on many other materials around the house. And here’s a real plus: With a two-year shelf life, Instant Bond is formulated to last much longer once opened than many other instant glues. So you really can keep it around. You’ll see professional contractors load their caulking guns with cartridges of construction adhesive, developed to bond the big stuff: concrete, drywall, tub and shower surrounds. But it’s a handy adhesive to have around the house, too. You can use it for bigger home projects and repairs involving common building materials. Construction adhesives are available in solvent- and water-based formulations. The professionals often prefer the solvent-based because it tends to be stickier up front and “grab” the item to be bonded. (The pros call this “green grab.”) But solvent-based products bring their own environmental issues, in the form of carcinogenic VOCs (volatile organic compounds). 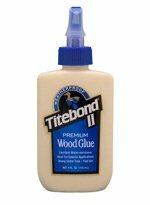 The makers of Titebond wood glues came up with a different kind of solvent-based adhesive that keeps the green grab but removes most of the VOCs. 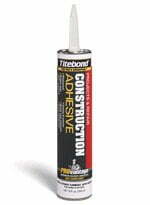 The PROvantage line of construction adhesives includes an all-purpose product, Projects and Repair, that will make you feel like one of the pros. If you are going to be working with much wood (say, repairing fencing or furniture), you might want to consider keeping a bottle of PVA (polyvinyl acetate) wood glue – often called yellow glue – on your shelf. This glue is water-based so is non-toxic and easy to clean up when wet using water. And you can get formulations that are water-resistant, too, so they work indoors or out. Look for products that meet Type II specification for water resistance, such as Titebond II Premium. These are just three of the many types of adhesives at your disposal. If you need to find an adhesive for a specific use beyond what any of these glues can handle, take a look at the Homeowner’s Guide to Glue. It provides an overview of all the different types of glues and their uses. Having just failed at installing anchors and screws I’ve given up on hanging my towel rack and want to glue a wooden hand towel ring to the wall instead. What glue would be good for attaching wood to painted drywall? Thanks.